Jedburgh Abbey lies on south facing slopes on the north bank of the Jed Water, close to the centre of Jedburgh. It was founded, initially as a priory, by King David I in 1138. His intention was partly to demonstrate to the English that the Scots could build on a grand scale so close to the oft disputed border between the two countries. In doing so he was tempting both fate and the English: and the result was not always a happy one for the abbey. 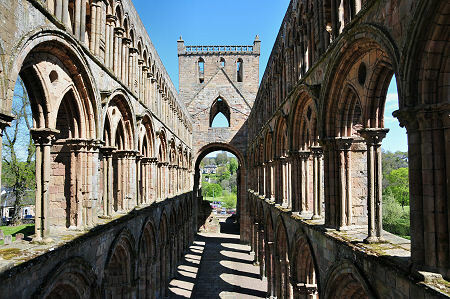 David had another reason for founding Jedburgh Abbey here. This site was probably the one used for a church built by Bishop Ecgred of Lindisfarne in 830. 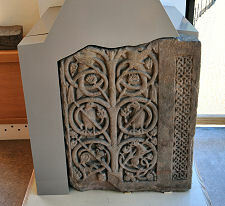 A beautifully carved fragment of a shrine on display in the visitor centre dates back to the 700s and suggests that even Bishop Ecgred was not the first Christian to worship here. 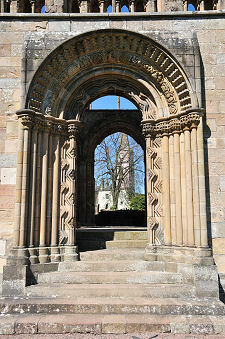 By 1080 the church at Jedburgh was well established. There is a story that the murderer of the Bishop of Durham, one Eadwulf Rus, fled to Jedburgh, only to be killed in revenge by a local woman. He was buried at Jedburgh, but his body was later exhumed and left to rot in a ditch. 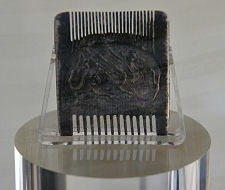 People have tried to link this story with the discovery of part of a body in a ditch near the later site of the chapter house, complete with a fine ivory comb, on display in the visitor centre. Not long afterwards conflict overtook the abbey and it was used as lodgings for King Edward I of England in 1296 on one of his many forays north. In 1305 another English army stripped the lead from the abbey roofs to help in the construction of siege engines. By 1312 the abbey was seen as supporting the English cause, and when the Scots recaptured Roxburgh Castle, the abbot and eleven canons had little option but to move for safety to Yorkshire. 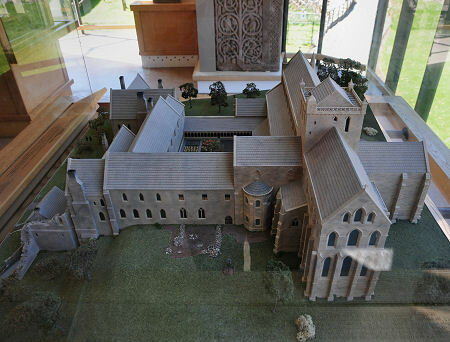 By the end of the 1300s the abbey and the religious community it supported had been rebuilt. But the town and abbey were attacked again in 1409, 1410, 1416 and 1464. More rebuilding followed, but in 1523 the Earl of Surrey arrived at the head of an English army and again badly damaged the abbey. This time the rebuilding was on a more limited scale than after earlier bouts of destruction, with parts of the accommodation remaining unusable and other parts only roughly repaired. In 1544 the Earl of Hertford and yet another English army attacked the town, returning in 1545 and again in 1547. 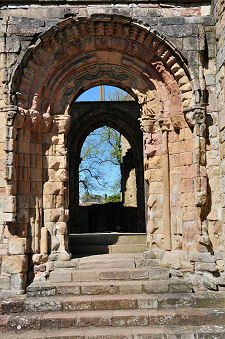 It is possible that the English occupying Jedburgh fortified the abbey. This was certainly done by the French army holding Jedburgh for the Scots in 1548: with ramparts around the abbey and artillery housed in the tower. At the time of the Reformation in 1560, there were probably only eight Augustinian canons left occupying parts of the shell of the abbey, using an area under the tower of the abbey church for their services. 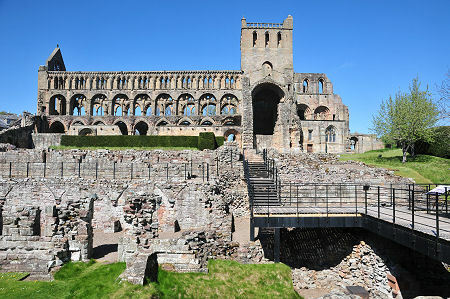 They were allowed to continue to live at the abbey and their reduced abbey church became used as Jedburgh's parish church. By the mid 1600s fears were being expressed about the structure of the tower, and from 1671 a new parish church was built into the west part of the nave of the original abbey church, presumably at what was felt to be a safe distance from the tower. A replacement Parish Church was built beyond the Jed Water in 1875 and restoration of the abbey was undertaken by the Marquis of Lothian. 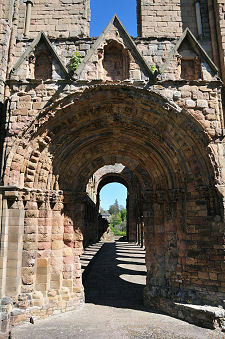 It was placed in State care in 1913 and is now looked after by Historic Environment Scotland. Today's visitor finds the abbey ruins spread over a magnificent sloping site. The visitor centre and shop has an excellent exhibition and viewing area on its upper floor, and from here you proceed out along a walkway through the domestic parts of the site, which though repeatedly used as a quarry after the abbey's demise still convey a sense of what once stood here. The abbey church, though very much a shell, retains much of its original stonework and as a result manages to convey the incredible achievement of its builders, and the sense of wonder it must have evoked in people when first built. A balcony at first floor level at the west end of the nave can be accessed via a narrow spiral staircase and gives superb views of the building. You descend via a second narrow staircase. A fascinating feature at its foot is a stone from a Roman altar set in the ceiling above you. Easy to miss, and well worth looking out for, is a small building attached to the west end of the nave, in which you find a "stone display". This amounts in practice to a second exhibition area, and should not be missed. Also worth looking out for is the burial aisle of the Earls of Lothian, located in the restored north transept of the abbey church.